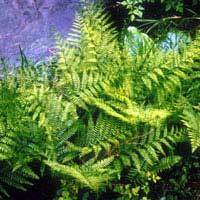 Prefering moist to wet shady conditions, this finely textured fern will rise to 4 feet or more. With age, the rootstock rises up and makes a short trunk from which the fronds spread out above. Vigorous and spreading. Can handle full sun in wet conditions.